Mask made by Maurice Castan in 1878. Is this the face of Robespierre? Well, no! It is just a splendid hoax, which took in most of the great and good of the French museum establishment in 1911. 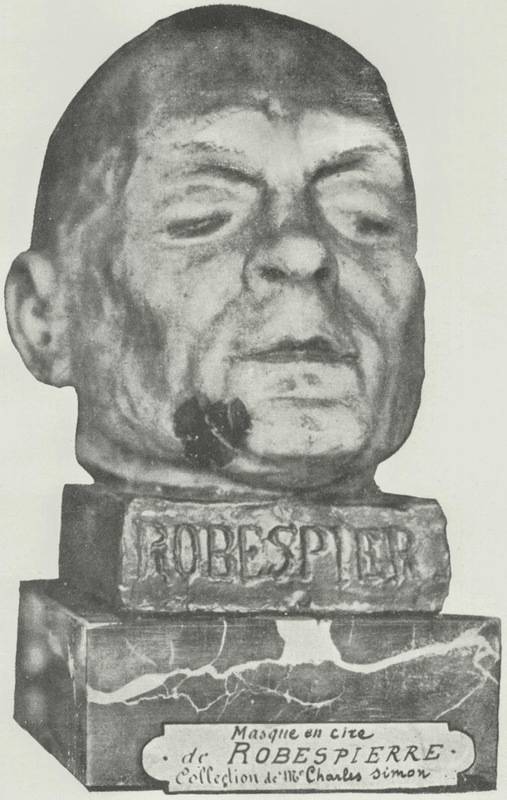 This "death mask of Robespierre" took pride of place in the inaugural exhibition of the Musée Carnavalet's new annexe in March 1911. A huge furore was created when, with the exhibition still in full swing, one Camille Liaume published an article in the Anvers newspaper Le Matin claiming not only that the object was a fake, but that he himself had created it in 1878! The mask (really a wax head) had first hit the radar in 1882 when its then owner, Charles Flor, wrote an account of how he had acquired it from an artist, identified only as "C*****", who had bought both the head and the original mould in England. Flor had a lengthy (and implausible) story about how Palloy, the enterprising demolisher of the Bastille, had contrived to model Robespierre's head at the foot of the scaffold and sold the waxwork to Marat's friend, the actress Mlle Fleury for 1,000 livres. Flor had subsequently given his "bibelot" to a newspaper editor, Charles Simon, whose widow duly donated it to the Carnavalet in 1903. Fooling a private collector was one thing, deceiving a museum whose exhibition had been attended by the President of the Republic was quite another! 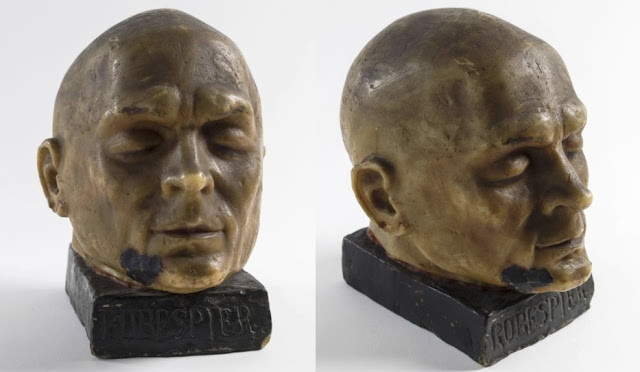 Camille Liaume (aka Charles Flor) now decided to come clean and admit that he had had the head made for him in 1878 by Maurice Castan, proprietor of a museum of wax in Brussels. He blamed Parisian journalists for originating the Palloy story, which he himself had embroidered. Castan and his wax museum were real enough. There was still the suggestion, however, that the mould "could have come" from the famous London waxworks of Curtius. Madame Tussaud's were keen to offer a replacement, but Georges Cain, director of the Carnavalet, his Gallic pride pricked, understandably refused.